The International Toy Fair wrapped up in New York this week, and I loved listening to a report from the floor as NPR reporter Margot Adler wandered the aisles of the show. She said the key words she kept hearing were classic, safe, green and affordable. Hooray! I’m a huge fan of the classic toys, those solid, tried-and-true basics that we had when we were kids. 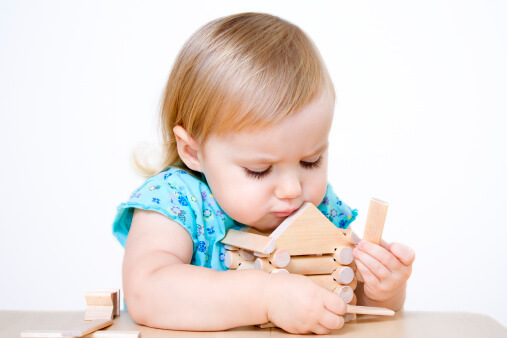 Think wonderful wooden blocks, made even more kid-friendly with natural finishes or toxin-free stains. One of my very favorite Greene family games is Cathedral, a beautiful showpiece board game with solid wooden pieces and a truly classic look. Even our beloved Slinky is making a comeback – less than $5 for a toy that keeps kids (and adults) entertained – even without a TV screen! When it comes to selecting toys for your child, I have a must-read simple toy guide for helping you pick items that will become new classics — treasured favorites, with many long hours of play time. This makes toys much more affordable. Far too often, expensive toys are quickly ignored in favor of little party favors, or even bubble wrap. As happy as I am about a return to the classic toys of our youth, I’m even more excited about the green toy trend. Manufacturers are using recycled products to create toys for our children that are clever, educational and safe. As one vendor in the report said, parents are starting to expect manufacturers to list the materials in their toys, much like the ingredients on a box of cereal. What a wonderful idea! We love toys made with materials that we can feel good about giving our children (like the teething toys from Under the Nile). Buying green toys can both support small businesses and help the environment, while protecting our little ones from potentially harmful toxins. Even the toys that aren’t exactly green are safer for our children this year, thanks to new regulations regarding phthalates in toys. Under a new US law, children’s products can no longer contain excessive phthalates, but unfortunately the regulation grandfathers in toys and products that already exist. I’m looking forward to seeing the terms classic, green and safe become more than just buzz words at the Toy Fair – I hope these words become the standard for toy production from here on out.